Planning a bathroom is a tricky job that's hard to get right first time. Of course, you can just copy the existing layout, but if you'd like to improve on what's there, if you're turning a bedroom into a bathroom or building an extension and creating a bathroom from an empty shell, careful planning and design know-how is a must. In this feature, we cover bathroom planning and budgeting, bathroom design, inspiration for your bathroom's new look, and bathroom buying guides so that you can furnish the room beautifully, too. If your bathroom is on the smaller side, you may have little choice as to its layout. However, if the room is larger, you will be able to be more adventurous with the positioning of fittings, perhaps choosing a statement bath to sit against a feature wall, including a walk-in shower for more of a wet room feel, or swapping standard basins for luxurious vanity units. Perhaps you're looking to create a stylish bathroom on a budget or need to create a room that can cope with a family's needs, despite its postage stamp footprint, and therefore need to invest in clever storage solutions. Use these guides below to start planning your bathroom's layout and main elements. Then go to page two for more detailed design advice and inspiration. Use our essential guide if you want to transform your bathroom. You'll find bathroom planning and design advice, plus ideas and advice for your new room. Creating a small bathroom needs very careful thought if you are to have a room that looks good and functions well. Here's how to approach it here. An en suite is a tricky space to design, but even the smallest of rooms can feel luxurious with the right layout and fittings. Find out how in our guide. Looking to add an extra bathroom that's space-savvy? A wet room is how you can do it. We show you how. Before you begin buying the elements you need for your bathroom, find out how to trim the cost of your new room with these expert tips and advice. Want to create a look that's luxurious without bashing your budget? Use our tips for designing a room that looks a million dollars – but doesn't cost it. While you're in the planning phase... use our guide to costing a bathroom makeover to get a good idea of the budget you'll need to transform your room. Planning a bathroom renovation rather than a complete overhaul? Use this practical guide to find out how to transform your room brilliantly. Knowing your way around your bathroom's basic plumbing system will ensure that when you're planning, you know what you're doing. Simples. From the best baths and sinks to suit your space and needs to finding the best bathroom flooring, we've got all the info you'll need. Which design, finish and shape will suit your new bathroom best? Which material? Which tap position? Which colour? Begin your research here. The bathroom sink can be a defining feature in your bathroom. But which shape, size, finish and colour to choose? Standard basin or countertop stunner? We help you pick. You might not give yours much thought day to day but it's an important design element. Think size, shape, back-to-wall, concealed, high level... We talk it through. With so many types to choose from, picking a new shower can seem complicated. Our expert guide takes the hassle out of choosing the right shower. Which will complement your new sink and bath. Which style, which tap position, which combination to go through. Decisions, decisions... which we'll help with. 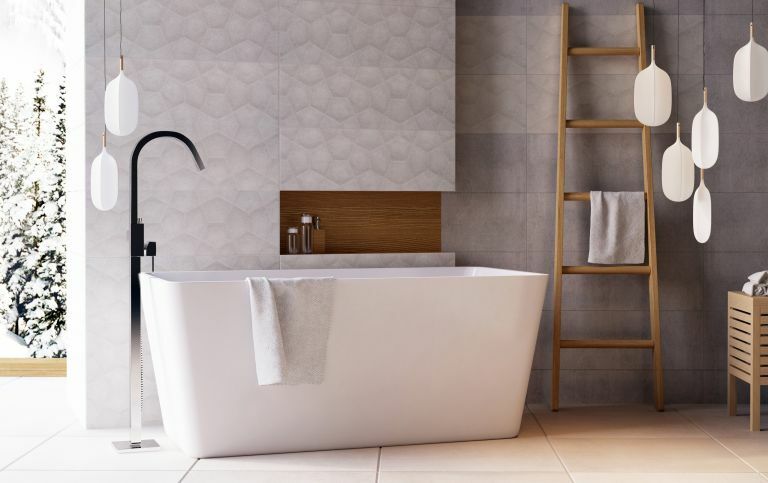 From ceramic and porcelain tiles to vinyl and wood, we look at all the options so you can give your bathroom a look that's unique to your style. Looking to tile your walls? We help you choose between the various options – and also give you more in-depth info about floor tiles. Find out what you need to know before buying. Lighting a bathroom well is vital if it's to be not only functional, but a welcoming space, too. We take you through the options – and talk regulations, too. Bathroom window treatments need to be good looking but super practical, too. We take you through everything from window film and shutters to blinds and curtains. Want some built in furniture to make your space sleek? Looking to create a laid back bathroom with freestanding pieces? We guide you through the options. A vital part of planning your bathroom's new layout is getting the storage levels and elements just right. Our guide will give you a practical, tidy space. Tiny bathroom? Take advantage of these storage ideas, designed with small bathrooms in mind. They'll make your space functional and neat. On our next page, we look at designing the bathroom, using tons of inspirational design features to inspire your new scheme. Our advice? Hop over to our Pinterest page to check out more inspirational images, and pin the pictures in our features to your own board to build a picture of your scheme.